The Auburn Tigers and Tennessee Volunteers split their dual meet in Knoxville tonight. On the men’s side, Auburn brought home the win with 162 points to Tennessee’s 138. On the women’s side, Tennessee took the win in front ofthe home crowd with 171 points to Auburn’s 129. Auburn’s SEC Champions Joe Patching and Michael Duderstadt swept their stroke specialties to help the Tigers to a win. Patching recorded a winning 47.97 in the 100 back before completing the sweep with his 1:44.54 in the 200 back. He also won the 400 IM in 3:47.89 in a tight race with Tennessee’s Sam McHugh (3:48.39). Duderstadt’s first win came in the 100 breast, where he went head-to-head with Tennessee breaststroke standout Peter Stevens. At the 50 mark, Stevens lead with a quick opening split of 24.87, but Duderstadt made a back half surge to win the race in 53.73 to Stevens’ 54.01. Duderstadt then went on to win the 200 breast, clocking the only sub-2:00 time with his 1:59.94. Tennessee’ Kyle DeCoursey swept the sprint freestyles, blasting a 19.85 in the 50 free to outswim Auburn’s Peter Holoda (19.94). He then topped the 100 free field, turning in a winning time of 44.24. Meghan Small and Colleen Callahan were the top performers for the Volunteer women. Small came away with 3 individual event wins, touching first in the 200 free (1:48.03), 200 back (1:56.01), and 400 IM (4:13.65). Callahan pulled off a successful double, winning the 100 breast (1:01.89) and 200 breast (2:13.88). Auburn sprint ace Julie Meynen, a freshman, continued to impress in the sprint freestyles. In the 50 free, she out-touched Tennessee’s Erika Brown to take the win in 22.65 to Brown’s 22.77. She then won the 100 free by nearly a full second, touching in 49.42 ahead of Tennessee All-American Kira Toussaint (50.34). Competing for the third straight weekend, the Auburn swimming and diving teams split a pair of dual meets at Tennessee on Friday afternoon. Auburn’s No. 5-ranked men (5-0, 4-0 SEC) downed No. 19 Tennessee, 162-138, while the No. 11 Auburn women (4-1, 3-1 SEC) fell to No. 14 Tennessee, 171-129. Joe Patching swept the backstroke events for the second time this season, winning the 100 in 47.97, almost two full seconds ahead of second, and the 200 in 1:44.54, three seconds ahead of second. He completed his individual events with a win in the 400 IM in a season-best 3:47.89, the fifth time this season he has won the IM at a dual meet. Luis Martinez swept the butterfly events for the fourth time this year, winning the 200 in 1:46.59, over a second ahead of second place, and the 100 in 47.26. Michael Duderstadt made it two straight dual meets in which he swept the breaststroke events, winning the 100 in 53.73, a season-best, and the 200 in 1:59.94. Teammate Tommy Brewer once again gave him a run for his money, placing third in the 100 in a season-best 55.25 and taking second in the 200 in 2:00.37. Auburn put the meet away with a win in the 200 free relay in a season-best time 1:19.13. Peter Holodasplit a 19.82 off the blocks, Auburn’s top 50 free time of the season. In the women’s lanes it was again two-time SEC Freshman of the Week Julie Meynen highlighting the results. She swept the sprint freestyle events, winning the 50 free in a season-best 22.65 and the 100 free in 49.42, keeping her undefeated in the 100 this season. Auburn claimed a 1-2-3 finish in the 1000 free from Ashley Neidigh (9:47.58), Zoe Thatcher (9:52.34) and Erin Falconer (10:08.84) and a top two finish in the 500 free from Falconer (4:52.09) and Neidigh (4:54.11). Friday’s meet will air on the SEC Network on Sunday beginning at 11am CT. The Auburn women and the divers will continue competition next weekend when it travels to Atlanta for the Georgia Tech Invitational, Nov. 17-19. KNOXVILLE, Tenn. — Freshman Meghan Small recorded the first career three-win day as the Tennessee women defeated Auburn 171-129 on Friday at Allan Jones Intercollegiate Aquatic Center. The Tennessee women took first in 12 of 16 events including both relays. Small won the 200-yard freestyle (1:48.03), 200 backstroke (1:56.01) and 400 individual medley (4:13.65), joining sophomore diver Rachel Rubadue and senior breaststroker Colleen Callahan as multi-event winners. In the men’s meet, the Vols won seven of 16 events in a 162-138 loss to fifth-ranked Auburn. Sophomore Kyle DeCoursey swept the sprint freestyle events, winning the 50 freestyle in a season-best 19.85 and the 100 freestyle in 44.24. In diving, junior Liam Stone swept the springboard events. The Tennessee women led off the day with a victory on the 1-meter springboard by Rubadue (272.63) and a victory in the 200 medley relay to lead off the day. The Vols kept the momentum going from there. Later in the meet, Rubadue also won the 3-meter springboard (295.88). Callahan recorded another two-win day, taking first in the 100 breaststroke (1:01.89) and the 200 breaststroke (2:13.88). 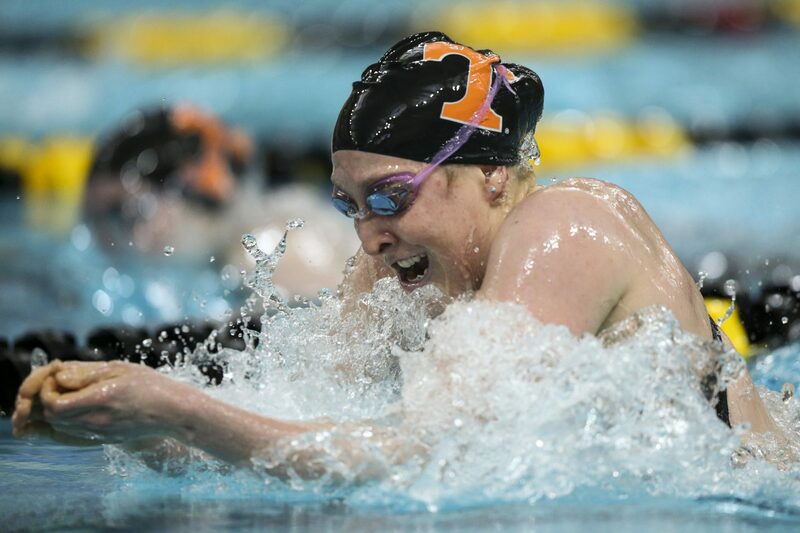 Additional Tennessee winners in the women’s meet included Kira Toussaint in the 100 backstroke (53.38), Heather Lundstrom in the 200 butterfly (1:58.87) and Madeline Banic in the 100 butterfly (52.94). The Vols closed the day with a victory in the 200 freestyle relay. The Vols’ distance swimmers led the way on the men’s side. Taylor Abbott sparked a 1-2-3 finish in the 1,000 freestyle (9:11.34). Junior Sam McHugh took first in a 1-2-3 finish in the 500 freestyle later in the meet (4:24.56), with Abbott finishing second. The Tennessee men started the day with a victory in the 200 medley relay. The Vols swam a season-best 1:26.65 with DeCoursey clocking a speedy 18.98 in the final freestyle leg. Sophomore Rachel Rubadue recorded a score of 272.63 to win the 1-meter springboard and then added a victory on 3-meter with a score of 2:13.88. “From the diving end of things I was very pleased,” Tennessee diving coach Dave Parrington said. “Liam was outstanding on 1-meter today. He hit a career high dual meet score on 1-meter and did some big dives that he hasn’t done as well as he did today, so that was exciting to see. “Kyle DeCoursey’s swim on the first relay really set the tone for us. Splitting an 18.9 in season is pretty rare. Matthew Dunphy decided to take a chance in the 200 Breaststroke and really got his team fired up. He finished third, but he did what he felt like he needed to do to win. He took a big chance, and that inspired the team. Taylor Abbott raced like a pro. Our distance men were outstanding as well.